The National Council on Nonprofits reports that the one of the most common questions they hear is “How do I start my own nonprofit?” They offer a series of specific steps and resources to help, which combined with the advice of an attorney familiar with the law of tax-exempt organizations in your state, can start you on the road to a new organization. When should you file your paperwork? Where can you get quality assistance? How can you create and sustain a nonprofit organization? This last question is perhaps the most important. In Vermont, a small rural state with thousands of nonprofit organizations, it is vital to find out if your mission is already being carried out by an existing organization. If so, it is important to get in touch with them and explore the wisdom of collaboration and partnership before you go through the time and expense of launching a new organization. Consider fiscal sponsorship or a partnership as an alternative! See below for details. Conduct an in-depth search of Vermont tax-exempt organizations at IRS.gov by key words, city or “deductibility code”. You may also search our interactive data site with a list of Vermont nonprofits and more! For budgeting needs, visit National Council of Nonprofits for resources and templates here. 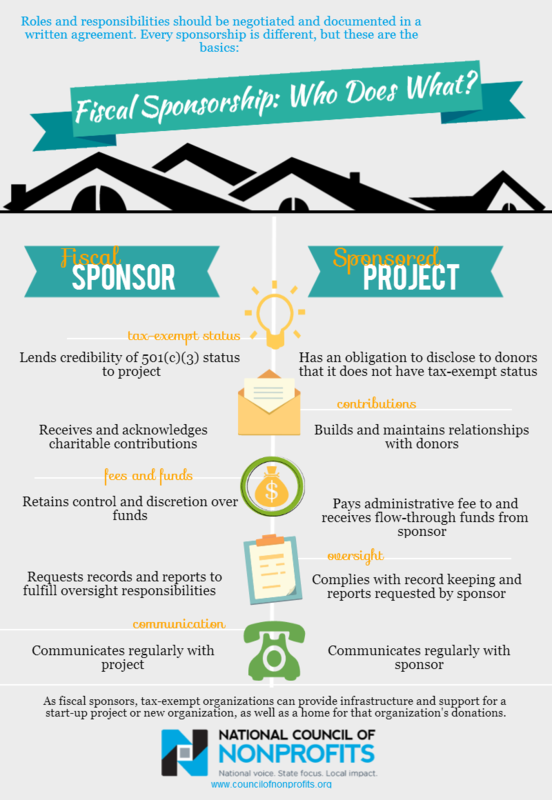 What does a fiscal sponsor do? The role of the fiscal sponsor can include performing many different administrative functions on behalf of the sponsored organization or program, including taking on the responsibility of receiving and administering charitable contributions on behalf of the sponsored organization. Some fiscal sponsors do a lot more, such as performing back-office functions. It is quite common and perfectly acceptable for the fiscal sponsor to charge an administrative fee for its services, which is usually a percentage of the budget of the sponsored organization or program. Using a fiscal sponsor satisfies IRS requirements as long as the fiscal sponsor maintains the right to decide, at its own discretion, how it will use contributions. Maintaining control over the donated funds is a requirement of a legitimate fiscal sponsor arrangement. Fiscal sponsorship is often used by newly formed nonprofits that need to raise money during the start-up phase, before they are recognized as tax-exempt by the IRS. Using a fiscal sponsor enables a program or organization that does not itself qualify as tax-exempt to attract funding for its operations that will — through the fiscal sponsor – be tax-deductible to donors. Therefore fiscal sponsor arrangements benefit organizations or programs that are not tax-exempt by providing a flow-through pathway for revenue that the organization may not otherwise be in a position to receive. Donors are not able to claim a tax deduction unless they itemize deductions and donate to an organization that is recognized by the IRS as tax-exempt pursuant to IRS Code Section 501(c)(3). See IRS Publication 557. Additionally, the guidelines of most private foundations explicitly require grantees to be recognized as tax-exempt by the IRS. Consequently, groups that are not formally recognized by the IRS as tax-exempt are generally not eligible for grants from private foundations. Fiscal sponsorship might be chosen by a newly formed nonprofit that seeks to test-drive its ideas to determine whether there is a market or a desire among the public to fund the end product. Some organizations/programs remain in a fiscal sponsorship relationship for a long time, deciding that their mission can be achieved in that structure without creating a new entity. Some organizations – including those that are tax-exempt – find that utilizing a fiscal sponsor to outsource administrative responsibilities, whether back-office tasks, or those relating to fundraising and disbursement of funds, is the right business model for them. This structure might be particularly well-suited for all-volunteer organizations. It’s best to outline the responsibilities and obligations of both parties in a written agreement between the fiscal sponsor and the sponsored organization. A sample is posted below. The agreement should specify that the fiscal sponsor is responsible for all legal compliance relating to receiving, reporting, and acknowledging charitable donations. The agreement should also describe the administrative fee that the sponsored organization will provide to its fiscal sponsor, as well as any recordkeeping responsibilities that the sponsored organization owes the fiscal sponsor. We have posted many more useful resources on an additional webpage for those looking for more details and ideas on where to find a fiscal sponsor or what to think about if your organization is considering serving as a fiscal sponsor.